Its very difficult to explain the concepts of power and energy. People often ask me “Can I power my kettle with that?”. So to try and put the energy in a cup of tea into perspective I built the ‘Cuppa-meter’. 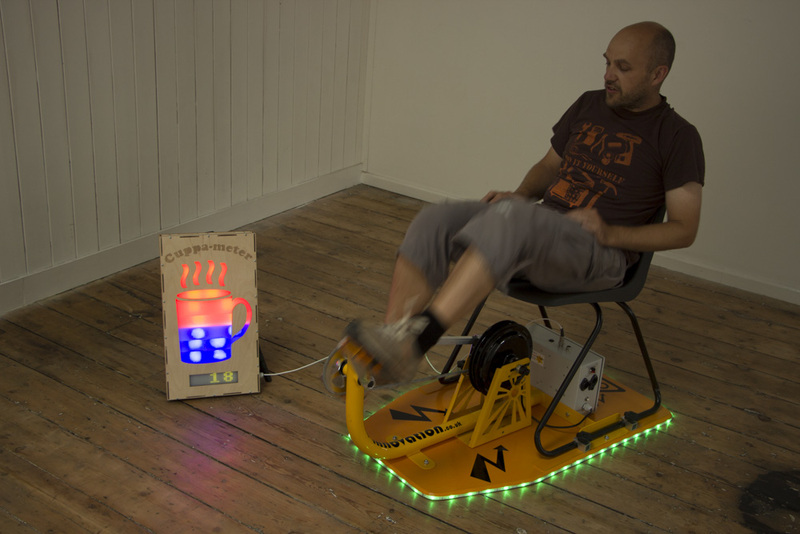 The ‘Cuppa-meter’ shows a cup of tea which lights up as the energy required for a cup of tea is generated. 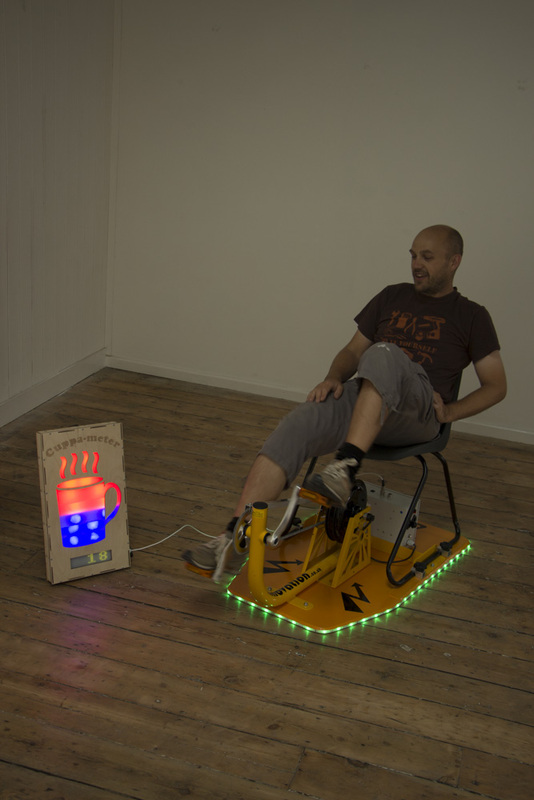 This can be plugged into a pedal generator and people can ‘feel’ the energy required to make a cup of tea. They can either pedal slowly (and hence low power) for a long time, or they can pedal hard (high power) for a shorter time. The end result (the energy) is the same – a nice hot cup of tea (or rather a lit up image of one). This post gives a few images of the cup of tea and also the calculations used. There is a scrolling LED display at the base of the unit showing instantaneous power. This was partially inspired by Pedal and Pour, a pedal-powered coffee bike in Oxford and doing demonstration workshops with Magnificent Revolution where we would pedal for a cup of tea at the end of the day. Please contact us if you would like something like this for your pedal power system. So how did I calculate the energy within a cup of tea? Firstly lets set the parameters – I am talking about the heat energy requirement to get a cupful of water from room temperature to boiling (100C, at sea level). This does NOT include the energy required to process and purify that water nor the energy embodied in the tea and tea manufacture, nor any milk or sugar added…. In my house kettle (rated at 1500W) enough water for a single cup of tea (around 250ml) takes around 60 seconds to boil. So we need to supply 25Wh of energy to boil a cupful of water. This could either be provided as 25W for 1 hour, or (as in the case of the kettle) at a much higher rate for a shorter time. A typical cyclist can provide around 100W, so it will take around 0.25h (15 minutes) to provide 25Wh. Pedalling at this rate for 15minutes really works up a sweat, which really drives home the point. It takes my 400W toaster around 2 minutes to toast a slice of bread. So the energy required is 400W x 120/3600 (h) = 13.3Wh, or around half the energy required to boil a cup of tea. I will also make a toast display to pedal for tea and toast. 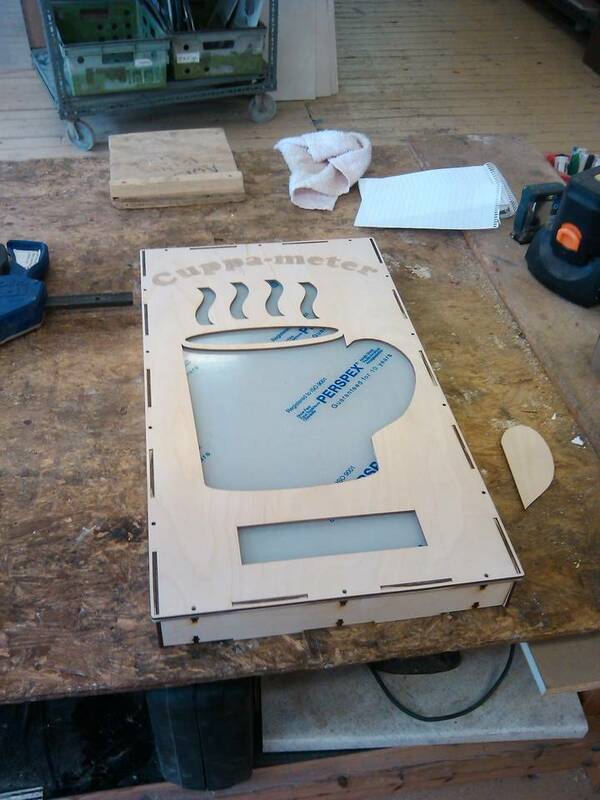 This was a prototype unit, built using the new laser cutter at Nottingham hackspace. 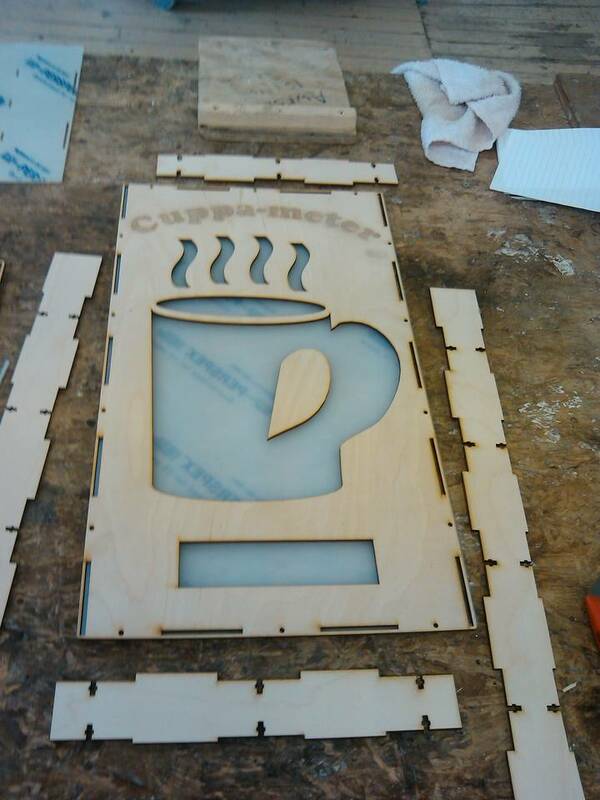 The unit had a frosted acrylic front for the light and a laser-cut wooden image. It has a number of levels within a cup of tea outline which light up as a certain amount of energy is generated. The levels are separated to ensure the light does not spill from one level to the next. 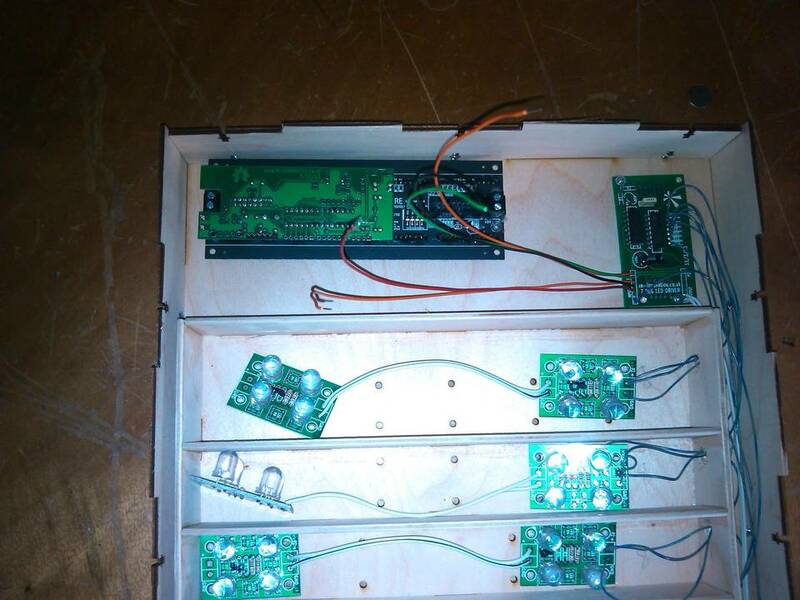 This shows the back of the 32×8 LED matrix, the Arduino main control board, a shift register (which controls each segment) and some of the 14 LED boards used. 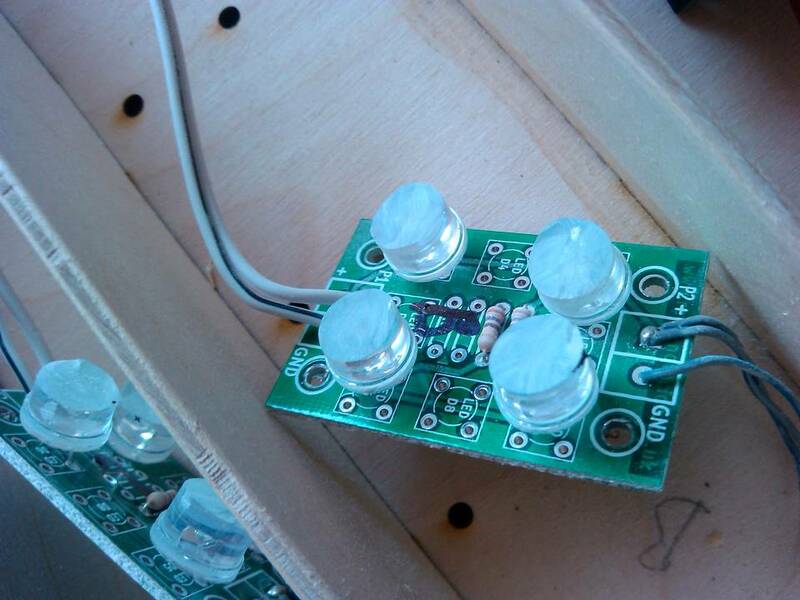 The LED units can have either 4 or 8 LEDs on each board. To ensure even light I used two boards for each line and also chopped off the top of these 10mm blues LEDs to disperse the light. 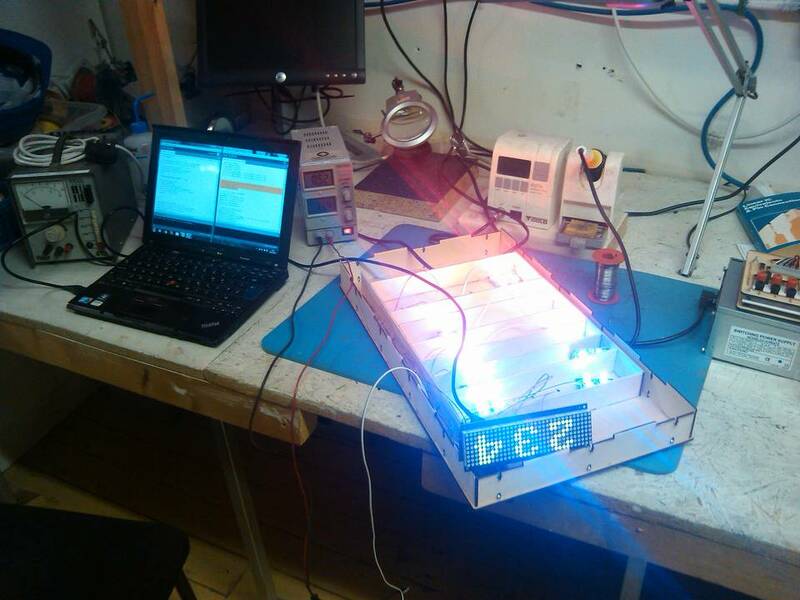 Here the display is being tested and new code uploaded. 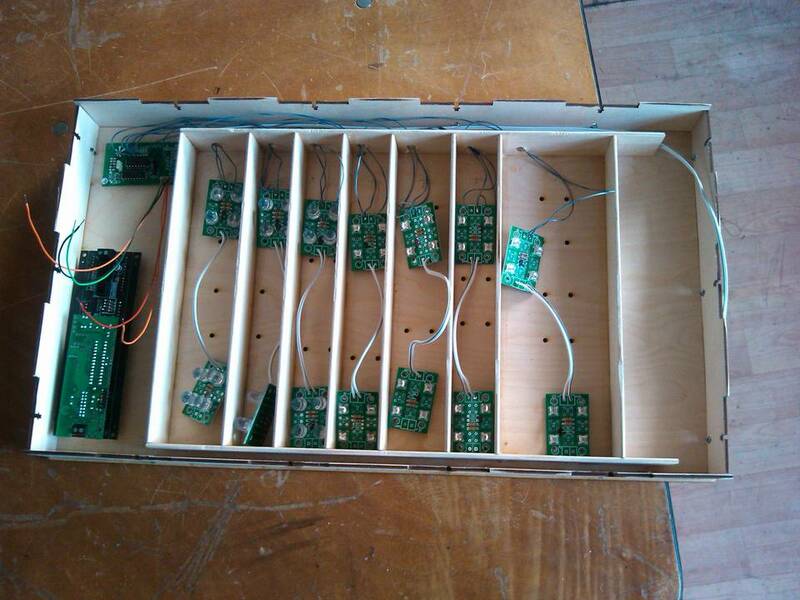 The code was written for the Arduino ‘brain’. The numerical display shows the instantaneous power, as shown on this blog post.